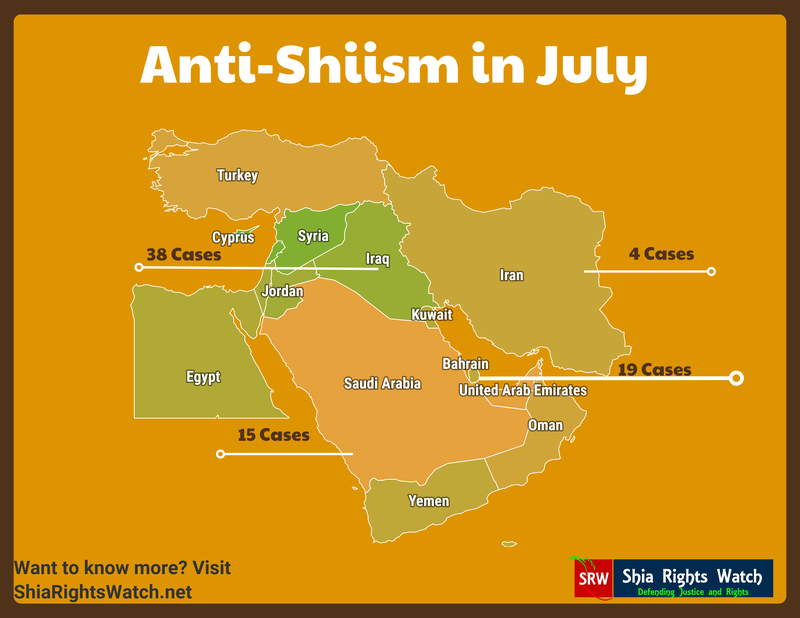 In July, Shia Muslims around the world continue to be discriminated against for practicing their faith. The claim that Shia Muslims are “idolatrous” or “heretical” is often used to justify heinous human rights abuses against Shia Muslims, and to obstruct their right to religious freedom. Shia Muslims throughout the world cannot enjoy the same universal right to worship as other religious groups. Presently, Shia Muslims cannot read, pray, have opposing opinions, advocate for themselves, go to school, be at their homes, be safe from discrimination under their constitutions, post on social media, or merely be Shia without the risk of being persecuted and having their Human Rights violated. Shia Rights Watch aims to bring awareness to the injustices Shia Muslims face across the globe in efforts to help ensure Human Rights for all Shia worldwide. 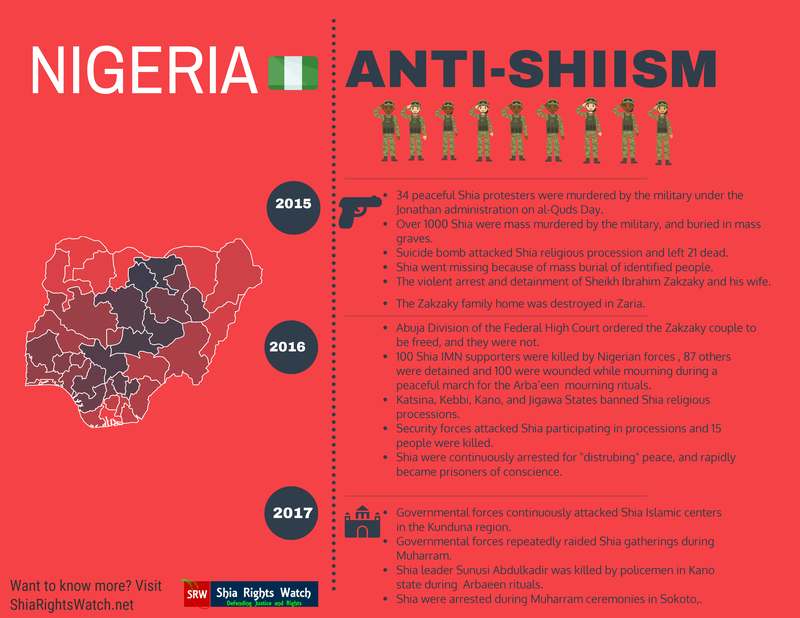 Wahhabism is on the rise and imposes massive cultural and religious deletion of Shia Muslims across the Middle East and leads to over-policing and many arrests in Shia areas, even restricting Shia educational opportunities. 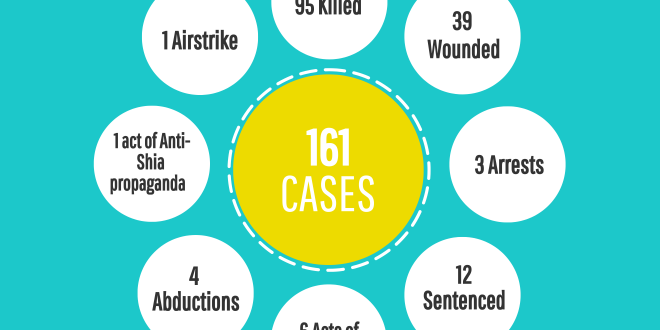 In July, the number of anti-Shia incidents totals to 161 cases. 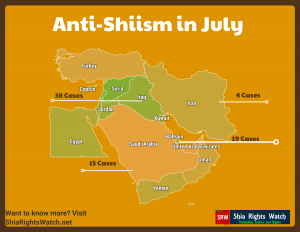 Anti-Shiism remains present, and discrimination manifests itself through many different forms of violations against the rights of Shia Muslims. According to Bahraini rights activists, sources report that Dry Dock Detention Center’s water supply was cut off for several days. A similar situation occurred in 2017 when guards from Bahrain’s Jaw prison cut prisoners off from the water supply for three days, denying detainees showers and access to toilets. The Prisoners and Detainees Rights Commission (PDRC) reported in 2014 that Dry Dock held a total of 991 detainees, 765 of which were Bahrainis, and 108 of which were between the ages of 15-18. This number was nearly at capacity at the time, and SRW has reason to believe the number has increased since then. Since the popular uprisings in 2011, the number of people being held in Bahraini prisons has increased dramatically. The results of inspections on the conditions of these facilities are grim, with reports of understaffing, overcrowding, lack of access to medical care, and conditions of torture and abuse. Although the cause of the water outage remains unverified, due to a history of violence and mistreatment at Bahrani detention centers, SRW continues to monitor all such situations for evidence of intentional abuse and religious discrimination. In 2017, The Economist estimated that 2,600 of the roughly 3,500 people detained in Bahrain are political prisoners. Since authorities do not collect demographic data based on sectarian divides, it is difficult to know the precise number of how many of these political prisoners are Shia. However, the government consistently and openly takes extreme measures in targeting Shia clerics, peaceful protesters, and political dissidents. Several incidents in recent years of mass arrests of Shia clerics, mass trials of Shia dissidents, and other blatant acts singling out Shia citizens lead SRW to credibly estimate that the majority of the 2,600 reported political prisoners are likely Shia Muslims. Multiple human rights watchdog organizations along with the United Nations have all explicitly criticized the Bahraini government for its openly anti-Shia laws and actions, confirming its egregious sectarian bias. 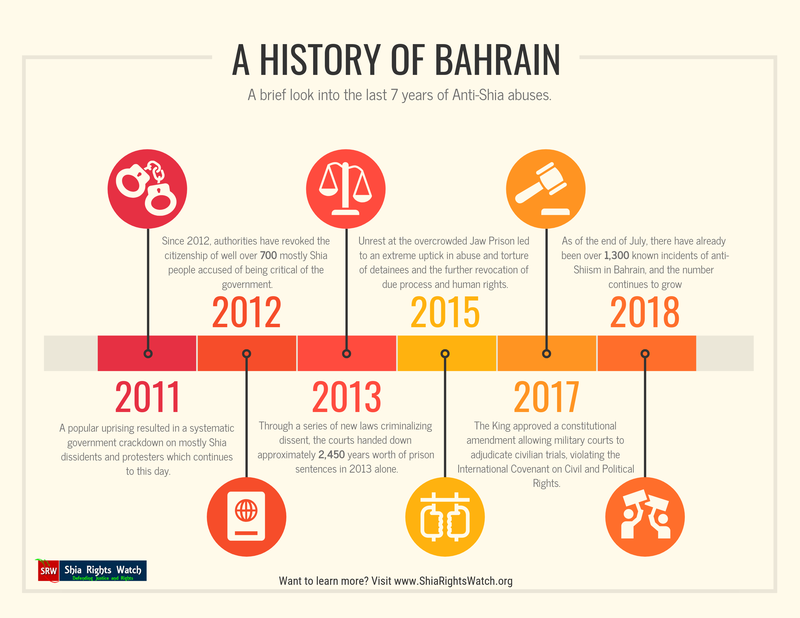 Analysis detailing the expansion of anti-Shia laws in Bahrain can be found on ShiaRightsWatch.org. Authorities have arrested Abdulhadi Mushaima, the father of the late activist Ali Mushaima who was killed during the Bahraini uprising, or “the Bahraini Day of Rage,” on February 14, 2011. The reason for the summons and subsequent detainment were not made clear. However, authorities regularly intimidate and arrest family members of activists and protesters as a tactic for discouraging dissent. Hajar Mansoor Hassan, a prisoner of conscience in Bahrain has been hospitalized for exhaustion and psychological trauma incurred while in detention. Some witnesses have claimed that the abuses are acts of retribution by the head of the prison, Maryam Albardoli, and are made in response to criticism of the government from both Hassan’s son-in-law, exiled rights activist Sayed Ahmen Alwadaei, and the experts at the United Nations Human Rights Committee. Likewise, prisoner Sayed Kadhem Abbas has endured inhumane treatment while detained. Sources say that lack of medical treatment and severely substandard facilities in Jaw prison led to his health deterioration. Abbas is now suffering from a brain tumor which is believed to have been exacerbated by his detention. Abbas received surgery for cancer and was transferred to the ICU to allow his health to stabilize. According to Enas Oun, head of Monitoring and Documentation at the Bahrain Center for Human Rights (BCHR), detainee Mohammed Al-Am has been severely beaten while imprisoned at Dry Dock Detention Center in Bahrain. Father of Shia Activist Osama Al-Saghir, says that authorities at Dry Dock Detention Center continuously deny well needed medical care to his son. Al-Saghir was sentenced to more than 40 years in prison. Al-Saghir was arrested last year in May’s bloody police raid in Diraz, which left many killed and injured. Former and current inmates have described conditions at Dry Dock as “intolerable” and “tragic.” Dry Dock has been under scrutiny in recent months for their methods of systematic harassment and abuse against political prisoners. Additionally, authorities in Manama have upheld the jail sentences of 3 dissenters, rejecting their appeal and reaffirming their ten-year prison sentences. Furthermore, Bahrain’s Supreme Criminal Court has sentenced five anti-regime protesters to 5 years in prison. They were charged with and found guilty of “deliberately setting fire to a vehicle and endangering the lives and property of ordinary people for a terrorist purpose” just south of the capital. Since authorities regularly skirt due process and fair trial practices during arrests and sentencing procedures, it is often difficult to determine when charges are trumped up as a means of suppressing activists. Since thousands of anti-regime protesters have been holding regular demonstrations since the 2011 uprisings, the government has enacted multiple “anti-terrorist” laws designed to justify the forceful crackdown on political dissidents. These laws have opened the doors to legalizing criminalization of basic rights and freedoms of society such as political dissent and the freedoms of speech and assembly. By keeping the definition of “terrorism,” broad, authorities can apply punishments to any number of legitimate civil activities in which they can allege are harmful against the kingdom or which damage national unity. The family of jailed political activist Khalil al-Halwachi reports that he and other political detainees have continued to be denied access to phone calls and other communications with their family members. 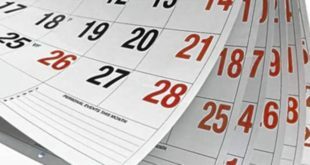 Limitations in communication come as a part of a trend in recent weeks in prisoner treatment wherein correctional officers consistently deny detainees rights to books, writing materials, and other personal possessions. According to prominent Bahraini human rights activist Ebtisam Al-Sayegh, current detainee Amira Al-Qasha’mi was harassed for possessing a pen while in prison. Sources say Al-Qasha’mi had previously requested a pen and when permission was granted, she was given one. Al-Qasha’mi’s family says she is being detained for no reason and that the authorities are issuing trumped up, politically-motivated charges to punish the family. Activist Ibtisam Al-Saegh further reports that detainee Hajar Mansour has had her children’s photos taken away from her, and Madina Ali is without bedding and continues to sleep on the floor. 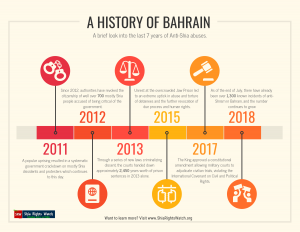 Like Bahrain, over the past several years Riyadh has also redefined its anti-terrorism laws to target activism and peaceful demonstrations, particularly in the Shia-majority Eastern Province. Government officials and Saudi religious scholars have called Shias “brothers of Satan” and often refer to them using derogatory terms, such as rafidha or rawafidh, which means “rejectionist.” Saudis have also implemented a discriminatory educational curriculum wherein the Shia faith is stigmatized, and students from an early age learn to perceive Shia religious beliefs and practices as bad, or “other.” Saudi religious clerics have utilized Fatwas and their influence over the judicial system to implement arbitrary criminalization tactics against Shia and their religious practices. Hate speech goes virtually unchecked on social media and in the press which only serves to perpetuate the anti-Shia attitude which currently prevails in Saudi Arabia, as will be shown in the following news reports out of Saudi Arabia from July. Saudi forces arrested Shia cleric Zuhair Hussain bu Saleh in another incident of the Riyadh regime’s persistent clampdown against dissidents and pro-democracy campaigners. Saudi Arabia has banned Shia Muslims from practicing their religion, and authorities have accused Saleh of holding illegal congregational prayers at his home. Saudi forces also detained another Shia citizen, Zouyer Bussehal, for holding congregational prayers at his home. Sources say Bussehal was arrested and given 50 lashes for performing prayers based on the Shia religion. Shia Muslims have not been allowed to set up a Mosque in Khobar to hold formal services. Therefore many clerics hold services of their own that may result in an arrest because authorities claim that congregational prayer meetings held in private homes are illegal. The right to freedom of belief and religion is continuously stripped from the Shia population in Saudi Arabia. Fighter jets launched airstrikes on the districts of Zabid and al-Tahita, targeting a school. The airstrike killed three citizens and wounded three others, one of which was a child. Saudi Arabia is showcasing that Shia Muslims can be attacked for merely praying or attending school. Additionally, Saudi authorities have sentenced two young men to death and one additional man to 23 years imprisonment. The individuals are from Qatif, the region of Saudi Arabia with the largest concentration of Shia Muslims. These men have been accused of instigating violence, inciting riots, carrying out sabotage, and promoting anti-government slogans. Saudi Arabia targets Shias with “anti-terrorism” charges. These types of accusations are a long-term practice in Riyadh utilized by the Specialized Criminal Court for sentencing Shia civilians and activists to long imprisonments and death sentences. Saudi court sentences a Bahraini to nine years in prison because he provided financial support to his fugitive brother, and he took part in protests in Qatif making him another prisoner of conscience. Saudi Arabian authorities have also banned this Bahraini man from returning to Saudi Arabia after his term is finished. Limitations in travel strip his right to religious freedom because the Holy Pilgrimage is held in Saudi Arabia annually. Segregationist policy against Shia in Qatif has to lead to over-policing and arrest of many Shia by their faith. U.N. spokeswoman for the United Nations human rights office, Ravina Shamdasani, issued a statement this month calling on the Saudi Arabian government to release those who have been arrested for peaceful protests and activism. Arrests include the 15 government critics taken into detention since mid-May, some of whose whereabouts are still unknown. 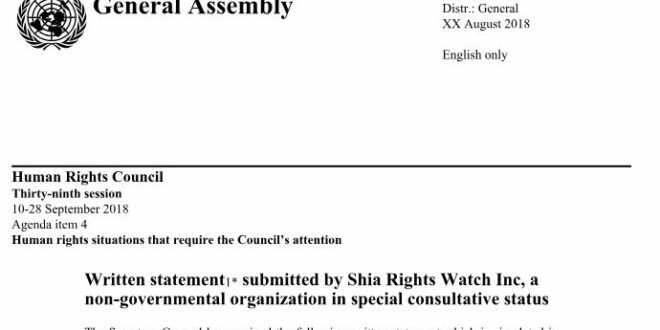 SRW raises concerns about increased grassroots violence against Shia Muslims in Saudi Arabia. Anti-Shia sentiment fueled by government-sponsored education has lead to targeting of Shia individuals by non-government actors. In Mid-July, a Shia security guard, Bagher ibn Ahmed, was killed as he exited his place of work in al-Ahsa. Sources say shooters attacked him. There has been little done by Saudi officials to investigate the death of Bagher. Authorities say they have found 36 more bodies from the Speicher Massacre in a cemetery at Saddam Hussein’s former palace in Tikrit. In a highly publicized 2014 attack, more than 1,700 Shia soldiers were slaughtered by ISIS after they took over the Camp Speicher military base. When the soldiers were captured, the gunmen deliberately separated the soldiers into Sunni and Shia groups, releasing the Sunnis and loading the Shias into trucks and driving towards mass graves where they were brutally murdered one by one. The video footage released by ISIS showing columns of men being lined up, beaten, and shot remains some of the grizzliest and most disturbing to date. Now that ISIS is losing significant ground in Iraq, government forces have once again gained access to territories previously held by ISIS. As a result, they have begun the process of locating mass graves of ISIS victims and attempting to identify each. According to The Independent, as of last year, less than 600 of the 1000 bodies found had been identified, and the search for the remaining bodies continues. The Speicher Massacre remains one of the most egregious campaigns against Shia Muslims by ISIS to have taken place. Now that ISIS is on the decline, it appears that they are lashing out in more extreme measures. Kidnappings, killings and other isolated attacks by ISIS are on the rise. June and July saw a spike in the number of ISIS-related violent incidents, but Iraqi government security advisor Hisham al-Hashimi has admitted that state media is intentionally hushing the figures to prevent the spread of panic. He says that terrorists have a goal to keep locals in fear, and the government wants to avoid playing into that tactic so that it doesn’t interfere with their ability to restore stability across the country. Al-Hashimi has stated that the Special Forces are short on the necessary resources required to hunt down and take out the remaining militants who tend to hide in mountainous areas. 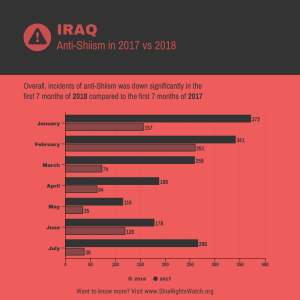 Since ISIS has a history of explicitly singling out Shia Muslims in attacks, SRW notes that the actual number of incidents of deliberate anti-Shiism in Iraq is likely much higher than is being reported. Further, SRW points out that measures to calculate occurrences of anti-Shiism in Iraq must be put in place by both the government and local communities. The current lack of statistical data undermines the government’s formal ability to root out violence and curb its effects. In a speech in 2016, former head of the particular branch division, Awaluddin Jadid, said: “If they (Shia) have a leader then it will become a problem for our security.” When asked about his anti-Shia rhetoric, he said, “The fatwa is that Shia is deviant and so it becomes a security concern.” By justifying these statements, he further spreads the wave of anti-Shiism in Malaysia. During an ongoing formal inquiry into the 2016 disappearance of Shia activist Amri Che Mat, Awaluddin concluded that Amri’s home had been used to promote Shia teachings which are illegal in Malaysia. Amri had spoken out against the police and religious authorities targeting Shia Muslims and was forcibly disappeared in November of 2016 after a group of vehicles surrounded his car and kidnapped him. His whereabouts are still unknown. The government claims that the elements of Shia beliefs are not “suitable” for the public, and Shia teachings are therefore deemed immoral. It is illegal to be Shia in Malaysia, and naturally, these types of discriminatory laws lead to various injustices in the hands of authorities and extremist groups. A recent Bollywood film called ‘Satyamev Jayate’ contains intolerant sentiments that lash out at the Shia community. Shia is speaking out against claims that they are violent and immoral people. In the trailer, Shia is seen celebrating Muharram in the act of violence, slaying each-other while being covered in blood. This portrayal of Shia Muslims dehumanizes them and attempts to make Shia religious practices appear deviant. It is already a misconception that Muslims are violent which has to lead to many discriminatory practices and acts of violence against them. Shia Muslims face double discriminatory in propaganda in the media. The negative portrayal of Shia practices is a major problem considering the role the media plays in shaping a society’s worldview, and films like this assist in rationalizing Shia discrimination. To categorize Shia as violent in the media fuels anti-Shiism worldwide and is not justifiable in the form of speech or entertainment. Board chairman Waseem Rizvi of the newly formed Shia Waqf political party in Uttar Pradesh, India, has allegedly received a death threat by email. Waseem claims that the danger comes from a Pakistani-based extremist group called Jamaat-e-Islami whom he says has ties to U.S. and India-designated global terrorist Sayeed Salahudeen, head of anti-India militant groups bent on annexing parts of India back to Pakistan. Threats to Shia individuals in positions of power is consistent to regional anti-Shia trends. In the past decade, India has stood witness to direct and indirect violence against Shia Muslims. When their lives are not being threatened, Shia in rising political roles are associated with foreign entities and undermined in patriotism. A 47-page landmark judgment by Justice Athar Minallah in the case for a missing IT expert Sajid Mehmood abducted from his home on March 14th, 2016, introduced severe penal consequences for officials involved in enforced disappearances. This judgment was determined as a result of a petition filed by the wife of Mehmood. She described the attack as several masked state security or law enforcement employees forcefully entering their home and abducting her husband. She filed a formal written complaint with the Shalimar police the day after the attack, when she could not receive any information on his whereabouts. Dozens of Shia Muslims protested outside of the Election Commission of Pakistan’s provincial office in Karachi. The demonstration was staged to protest the decision to allow ringleaders of banned terrorist outfits to run in office by changing their names. These terrorist groups were involved in several Shia killings, and to have them in office would mean further anti-Shiism discrimination story practices could be codified into law. Anti-Shia terrorists have targeted Shia seminary Tanzeemul Makatib in the neighborhood of Rizvia Society, Karachi, by launching a grenade in the room of a religious scholar on the premises. An on-duty watchman, 50-year-old Yawar Abbas, was injured in the blast and rushed to a nearby hospital where he was treated for his wounds. At least 31 people have been killed by an ISIS-affiliated suicide bomber in the Shia majority town of Quetta. The attacker was trying to enter a polling station during Pakistan’s general election when police attempted to apprehend him. He detonated the bomb just outside before the police could reach him. Even though polling resumed in the area shortly after the attack, reports say that voter turnout has remained low. With ISIS’ history of targeting Shia populations, this is an apparent incident of anti-Shiism and an attempt to keep Shias from participating in elections. More than 180 people have been killed so far during this brief and highly contentious election cycle. Sources say Governor El-Rufa’i ordered soldiers to open fire on Shia Muslims in Zaria, Nigeria as they were peacefully mourning the tragic killings of 34 Shia by the military under the Jonathan administration in 2015. In that year alone, military personnel killed 34 peaceful Shia protesters during a pro-Palestinian rally on al-Quds Day. Presently, while mourning these deaths, four Shias were injured with gunshots while an unknown number of people were arrested. Peaceful Shia protesters are often targeted by Nigerian soldiers and the Nigerian Police force. 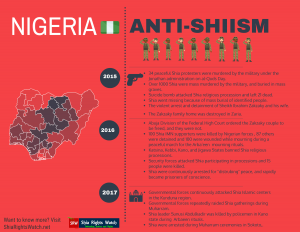 Freedom of expression is not guaranteed to Shia Muslims in Nigeria, and when they express their rights to expression, it often leads to extralegal killings. Human Rights Writers Association Of Nigeria (HURIWA) has written the United States Congress asking them to impose sanctions and an embargo on Nigeria until these inhumane, unjust murders cease to occur. At least four people were killed when Iran forces opened fire on protesters who had gathered to speak out against a water shortage in the city of Khorramshahr. Video footage appeared on social media showing what seemed to be automatic gunfire and tear gas released into the crowd. Protests have been held for several days as citizens are frustrated with what they say is mismanagement and corruption in the government, leading to extreme economic woes and infrastructure issues, like a lack of clean drinking water. Iran has a history of cracking down on dissent and on any speech that can be perceived as critical towards the government. According to reports, similar protests that took place in late December and early January saw at least 25 people killed and nearly 5,000 arrested. Although Iran is a Shia-majority country, it nevertheless has a history of violence against critics of the government. Iran regards itself as an Islamic republic, yet those who express religious views or critique how the government operates are punished, often by arrest and imprisonment. 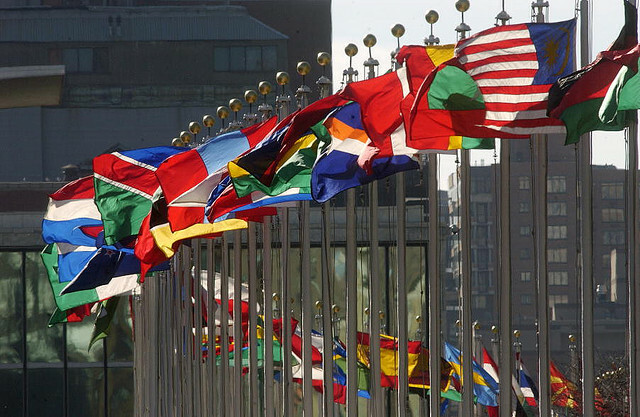 Iran must allow its citizens the freedom of expression to speak openly about both their religious and political views, a universal right recognized by the United Nations in Article 19 of the Universal Declaration of Human Rights, for which Iran voted in favor at the UN General Assembly meeting in 1948. 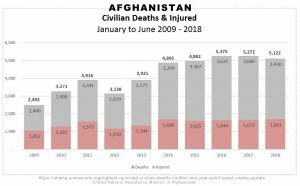 Despite the recent ceasefire agreement between the Afghan government and the Taliban which took place in June during the Eid al-Fitr holiday, the number of civilian deaths in Afghanistan has risen 1% according to a UN report. 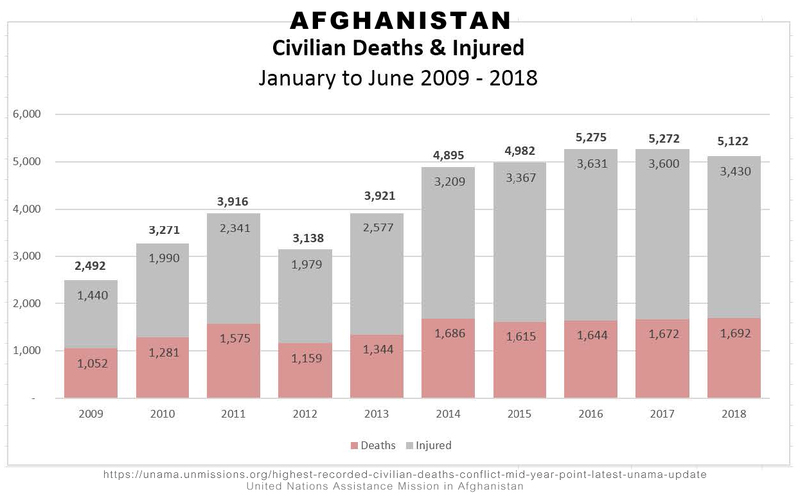 During the first six months of 2018, there were 1,692 civilian deaths, more than at any comparable time in the last ten years. The spike in deaths is in part due to a surge in suicide attacks claimed by ISIS. ISIS has claimed responsibility for a suicide bombing targeting the Ministry of Rural Rehabilitation and Development (MRRD) in Kabul, killing seven and wounding dozens more. The attack came a month barely after the MRRD building was targeted by a suicide bomber in mid-June resulting in the deaths of at least 12 people, with another 31 or more wounded. Officials had said that both employees at MRRD and civilians were killed and that both bombers waited until the end of the workday when employees were exiting the building and waiting for transportation. A back-to-back coordinated attack on an Education Department building in Jalalabad parallels the twin attacks on the MRRD. Sources say more than 20 are dead as a result of the suicide bombings for which no group has yet to take credit for. According to the New York Times, suspicions again point to ISIS which has a significant foothold in the region and has openly announced plans to attack schools in the area. Although the direct victims of these coordinated attacks may not all be Shia Muslims, SRW believes the message of these violent incidents aim to deliberately undermine agencies and organizations who assist minority populations, like Shias, in Afghanistan. The MRRD is an agency created to combat extreme poverty and promote independent, democratic governance. Their vision is “to ensure the social, economic and political well-being of rural society, especially poor and vulnerable people.” The Shia population in Afghanistan, mainly of the Hazara ethnic group, are consistently made targets of violent attacks by both the Taliban and ISIS and continue to face systemic oppression. Lack of stability in the government and the economy creates a breeding ground for the ongoing presence of extremist groups in Afghanistan. The result is that the Shia population is exceptionally susceptible to discrimination on all levels. SRW believes ISIS’ choice to target the ministry designated to promote the well being of minority communities, like Shia Muslims, combined with the deadly attacks against the Education Department, is a deliberate assault on the vulnerabilities facing this population. Following months of relentless attacks on the Shia towns of al-Foua and Kefraya, an estimated 6,000 civilians were evacuated from their hometowns. The two municipalities rank at one of the highest targets of violence amidst war in Syria. Not only were Shia residents in these towns targeted by ISIS militants looking to advance geopolitical grounds, but also by religious extremists acting on a cultural belief that Shia is “vermin” in the nation. Also, anti-Iran actors limit aid and humanitarian action in al-Foua and Kefraya as a means to reduce Iranian influence in the country. Discrimination against Shia in the context above is an expansion of a false association of Shia Muslims with the Republic of Iran. Evacuation efforts come after an extraction effort in April which was targeted by ISIS militants, leading to the death of 150, 72 of which were children. While anti-Shiism in Syria is prevalent, there has been limited action in meeting the progression of violence against this population. In 2016, Secretary Kerry identified Shia Muslims as targets of militants aiming to “kill them, to fight them, to displace them, and to cleanse the land of their filth.” However, since then, there has been no implementation of programs that are inclusive to the Shia population. Anti-Shia discrimination has become the trademark of many governments and regimes in the Middle East and around the world. Drastic measures taken by authorities designed to systematically harm, discriminate against or suppress the voices and livelihoods of Shia communities have left millions of Shia Muslims feeling as though their own country considers them its enemy. In many places, like Bahrain, Shias are all but left out of the decision-making and legislative operations, leaving them increasingly underrepresented in any civil or governmental processes. This lack of representation only serves to increase the reach of discriminatory practices utilized against Shias. For example, discrimination can manifest itself in a variety of ways, such as a general crackdown on dissent, an increased presence of security forces which leads to an increase in police brutality, or the perpetuation of economic disenfranchisement, to name just a few favorite tactics. As some human rights experts have noted, if Shia Muslims were considered a race rather than a religious sect, in many countries their situation would nearly fit the definition of apartheid. SRW believes there is still much work to be done to correct the systematic repression imposed by government institutions worldwide. We must work together to repair the discriminatory mindsets and ideologies that inspire extremists to conduct attacks against Shia Muslims. Freedom of expression is a key to lessen the suffering and discrimination endured by Shia Muslims, as silence creates complicity and complicity masks the issues at hand. SRW will continue to give a voice to those who have none until every Shia Muslim has access to fundamental human rights and fair treatment.